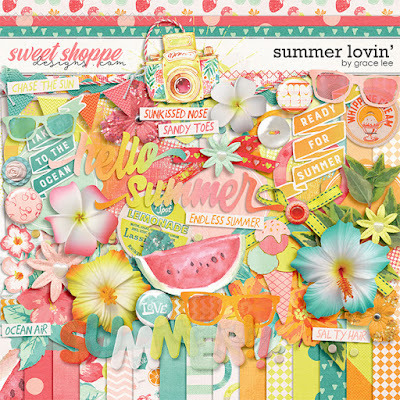 Summer Lovin' has refreshing colors and a retro vibe that's perfect for the fun and happy season! Be it a sunshiny outing, a day by the pool or a cool sweet treat you're enjoying, this beautiful kit has you covered. It's just perfect for capturing those amazing summertime stories! 75 elements. The elements included are 1 banner, 4 bouquets, 2 bows, 1 branch, 3 buttons, 2 cameras, 3 flairs, 10 flowers, 1 frame, 2 ice-cream, 4 labels, 2 milk caps, 3 paint, 3 ribbons, 1 ric ran, 8 rings, 3 scatters, 2 stitching, 1 string, 1 sunburst, 6 sunglasses 2 titles, 8 word art and 2 watermelons.